Combat heat with Antec’s C400 CPU Cooler. Designed for leading Intel and AMD processors, the C400 CPU Cooler supports Intel® Core™ i7 Extreme, and AMD™ Sempron, among others. The 8 mm thick copper coldplate and nickel-plated aluminum fins with four embedded heatpipes achieve maximum heat transference as well as lightweight durability. 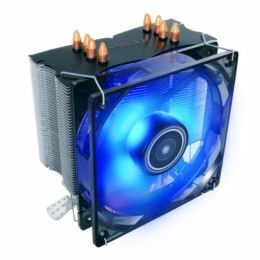 And with the stealthily quiet blue LED PWM (pulse width modulation) fan, the C400 CPU Cooler is the perfect tool to combat heat when overclocking your processor.